For the first time such large planets as Venus, Jupiter, Mercury and Mars were built to one line and shined east part of the sky early in the morning during the first hours sunrise over Sydney in Australia. This week the brightest planet Venus came nearer at once to Jupiter, Mercury and Mars and arranged so-called “the planetary summit”. Such unique astronomical phenomenon hardly will repeat till 2040. So just now it is possible to see an interesting phenomenon with four planets built practically in a rank in the photo, made over Sydney at sunrise. 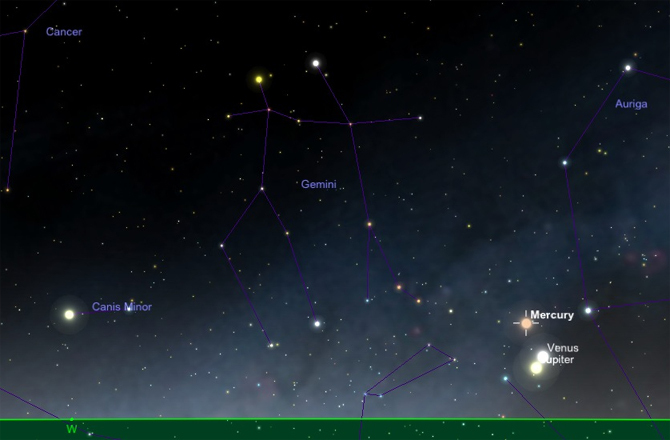 Planets will move in such unusual position till May 28, and then Jupiter, Mars, Venus and Mercury will meet accurately in one row, and then the Moon forms a triangle with Mars and Venus. Saturn, one more planet, which will be visible with the naked eye, also will come nearer quite close to Earth because of its gravitation.